Wherever there are people, there is music. And wherever musicians are, their music is always with them, waiting to get out. 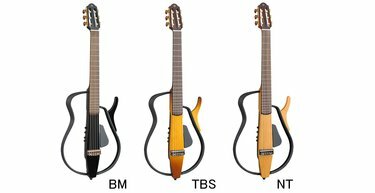 Yamaha’s Silent Guitar now means that wherever you are, and whenever you want to play, your guitar can be right there with you. Cutting edge design and master-luthier craftsmanship are uniquely combined to create a guitar that offers outstanding playability matched with incredible practicality - all with the same attention to detail as the guitars that have been played by some of the biggest names in music, players such as Jimmy Page, Brian May, John Lennon, Paul Simon and Joe Bonamassa. At home or on the road, with headphones or direct into a recording console, in the rehearsal studio or on stage in front of 20,000 fans Silent Guitar performs perfectly and gives you something new. The ability to really have your music with you, wherever you are. In comparison to a traditional classical guitar, the SLG110N’s slimmer neck and lower action allow the player to develop a quicker and more aggressive style. The digital effects taken from the class-leading SPX studio effects and industry-standard digital mixing consoles developed by Yamaha Commercial Audio, audiophile quality and the ambience of a warm, small room or luxurious large hall are with you wherever you are. 4 effects are avavailable; Reverb1, Reverb2, Chorus and Echo.